1300 Easy Dial will not make an attempt to identify users or their browsing activities. However, in the unlikely event of an investigation, a law enforcement agency or other government agency may exercise its legal authority to inspect our Internet Service Provider’s logs. You don’t want people to search through the yellow pages or the web for your phone number. It’s dangerous, as they can easily find some ‘new offer’ from a competitor and be snatched from you. Better to have a number that is on people’s minds straight away so they can call you directly. This simple change makes all your marketing so much more effective as in the example shown with Focus Fitness. This is because when people see your phone number they remember it (even if they just see it in passing or on a brochure or sign) and then they can call at their convenience. You only have 3 seconds to make a positive impression on your customers or they disappear from you like a ship in the night. 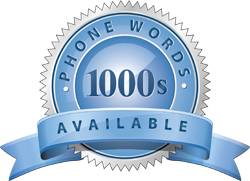 This makes Phone Words a great opportunity to brand your company in a very positive way.